Dr. Anne-Marie BOUGARD [Parents]-B0105 #. M i Adam Christian JACKSON-J0001 #. F ii Dr. Emma Louise JACKSON-J0002 #. John JACKSON [Parents] [scrapbook]-J0204 # was born on 06 Jul 1923 in Blackburn, Lancashire. He was christened 1 on 07 Aug 1923 in the Church of Saint Mathew in Blackburn, Lancashire. He died on 06 Jul 1980 in Lower Darwen, Lancashire. He was buried on 11 Jul 1980 in St James's, Lower Darwen, Lancashire. 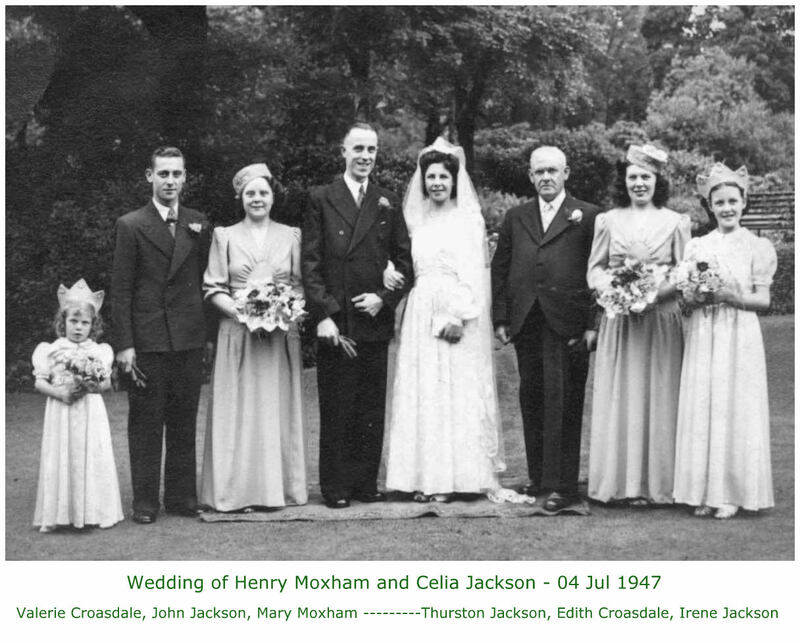 John married Grace JACKSON-J0205 # on 18 Sep 1943 in Blackburn, Lancashire. John worked as a Mechanical Engineer. In Sep 1939, John was living with his parents at 31, Oxford Street in Blackburn and was working as a Yarn Dyer. Grace JACKSON [Parents] [scrapbook]-J0205 # was born 1 on 25 Oct 1923 in Blackburn, Lancashire. She died on 15 Jun 1984 in Wythenshawe, Manchester. She was buried in Jun 1984 in St James's, Lower Darwen, Lancashire. Grace married John JACKSON-J0204 # on 18 Sep 1943 in Blackburn, Lancashire. M i Norman JACKSON-J0101 #. Thurston JACKSON [Parents] [scrapbook]-J0309 # was born on 12 Jan 1890 in Blackburn, Lancashire. He was christened on 26 Jan 1890. He died on 01 Jul 1965 in Blackburn, Lancashire. He was buried in Jul 1965 in Pleasington Cemetery, Blackburn. Thurston married 1 Sarah HOWSON-H0301 # on 03 Apr 1915 in Blackburn, Lancashire. Thurston was recorded in a census 2 on 05 Apr 1891 at 42, Oxford Street, Blackburn, Lancashire. He was recorded in a census 3 on 31 Mar 1901 at 42, Oxford Street, Blackburn, Lancashire. He was recorded in a census on 02 Apr 1911 at 42, Oxford Street, Blackburn, Lancs. Thurston enlisted in the Army on the 11th December 1915, aged almost 26 and just over 8 months after he had married. During 1916 he underwent training as a Driver with the Royal Field Artillery regiment and was held in Army reserve until he was mobilized on the 3rd February 1917. He moved to Aldershot on the 8th April 1917 and on the 9th June 1917 was posted to 117 Brigade (part of 26th Division), who at that time were stationed in Egypt. However, his stay in Egypt was brief, as 117 Brigade were sent to France on the 27th July 1917 to join the 74th Division, where they stayed until the Armistice on the 11th November 1918. On the 1st June 1918, Thurston was sent to a field hospital with a fracture of the large bone (radius) in his right forearm and was sent back to England. On the 8th October 1918 he was discharged from the Army as 'no longer physically fit for war service' and awarded the Silver War Badge. By wearing it, a man not in uniform could show that he had done his bit but was no longer physically able to continue. He had various occupations; a Cotton Weaver, a Soldier, a Booky's Runner and later a Nightwatchman at the Palatine Dairy in Blackburn. Thurston was known to his family and friends as 'Tot'. Thurston's Army Service Records, which are in quite a poor condition, can be viewed in Folder J0309 in the 'JacksonTree Document Archive' (button on the Home Page). In Sep 1939, Thurston, his wife Sarah and children Celia, John and Irene, were living at 31, Oxford Street in Blackburn. Thurston was unemployed. Sarah HOWSON [Parents] [scrapbook]-H0301 # was born on 26 May 1892 in Blackburn, Lancashire. She was christened on 20 Jul 1892 in Blackburn, Lancashire. She died on 01 Aug 1969 in Blackburn, Lancashire. She was buried in Aug 1969 in Pleasington Cemetery, Blackburn. Sarah married 1 Thurston JACKSON-J0309 # on 03 Apr 1915 in Blackburn, Lancashire. Sarah was recorded in a census 2 on 31 Mar 1901 at 201, Higher Audley Street, Blackburn. She was recorded in a census on 02 Apr 1911 at 45, Ingham Street, Blackburn, Lancashire. She worked as Cotton Weaver in Blackburn. When her Mother Agnes died in 1904, Sarah, aged 12, went to live with her brother Amos's family until some time in 1914 when her marriage to Thurston was announced. She then moved for a short while into the home of her Brother John Edward Howson. On page 8 of her brother Alfred's Army Records, form dated 11 Aug 1919, Sarah is recorded as living at 31, Oxford St, Blackburn. Thurston JACKSON-J0201 was born 1 on 27 Jan 1918 in Blackburn, Lancashire. He died 2 about Feb 1918 in Blackburn, Lancashire. F ii Celia JACKSON-J0203 was born on 24 Sep 1919. She died on 23 Jan 2011. M iii John JACKSON-J0204 # was born on 06 Jul 1923. He died on 06 Jul 1980. F iv Irene JACKSON-J0202 was born on 28 Mar 1936. She died on 19 Dec 2001. John JACKSON [Parents] [scrapbook]-J0401 # was born on 18 May 1853 in Blackburn, Lancashire. He died on 24 Apr 1927 in Blackburn, Lancashire. He was buried in the Old Cemetery, Blackburn. John married 1 Mary Ann ALSTON-A0401 # on 16 Jun 1873 in the Church of St Paul, Blackburn, Lancashire. John was recorded in a census 2 on 08 Apr 1861 at 34, Lyon Street, Blackburn, Lancs. He was recorded in a census 3 on 02 Apr 1871 at 52, Brunswick Street, Blackburn, Lancashire. He was recorded in a census 4 on 03 Apr 1881 at 6, Oxford Street, Blackburn, Lancashire. He was recorded in a census 5 on 05 Apr 1891 at 42, Oxford Street, Blackburn, Lancs. He was recorded in a census 6 on 31 Mar 1901 at 42, Oxford Street, Blackburn, Lancs. He was recorded in a census on 02 Apr 1911 at 42, Oxford Street, Blackburn, Lancs. Mary Ann ALSTON [Parents] [scrapbook]-A0401 # was born on 13 Jan 1854 in Blackburn, Lancashire. She died on 13 Dec 1938 in Blackburn, Lancashire. She was buried in the Old Cemetery, Blackburn, Lancashire. Mary married 1 John JACKSON-J0401 # on 16 Jun 1873 in the Church of St Paul, Blackburn, Lancashire. Mary was recorded in a census 2 on 08 Apr 1861 at 8, Jubilee Street, Blackburn, Lancashire. She was recorded in a census 3 on 02 Apr 1871 at 89, Moor Street, Blackburn, Lancashire. She was recorded in a census 4 on 03 Apr 1881 at 6, Oxford Street, Blackburn, Lancashire. She was recorded in a census 5 on 05 Apr 1891 at 42, Oxford Street, Blackburn, Lancashire. She was recorded in a census 6 on 31 Mar 1901 at 42, Oxford Street, Blackburn, Lancashire. She was recorded in a census on 02 Apr 1911 at 42, Oxford Street, Blackburn, Lancs. RESEARCH: The 1911 census records that Mary Ann had 13 children, of which 4 had died. Of the 11 children I have identified, James (J0304) and Alice (J0302) had died before 1911. M i Joseph JACKSON-J0307 was born on 13 Oct 1873. He died in Dec 1953. M ii William JACKSON-J0306 was born on 12 Apr 1875. M iii John JACKSON-J0303 was born on 23 Dec 1876. 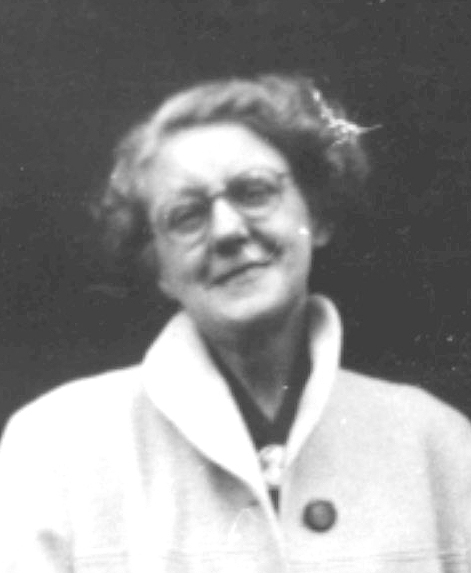 F iv Ellen JACKSON-J0301 was born on 27 Dec 1878. She died about Aug 1953. F v Mary JACKSON-J0305 was born on 04 May 1881. She died about May 1955. F vi Celia JACKSON-J0308 was born on 05 Aug 1883. She died about Feb 1959. Thomas JACKSON-J0317 was born about 1885 in Blackburn, Lancashire. Thomas was recorded in a census 1 on 05 Apr 1891 at 42, Oxford Street, Blackburn, Lancashire. He was recorded in a census 2 on 31 Mar 1901 at 42, Oxford Street, Blackburn, Lancashire. James JACKSON-J0304 was born on 16 May 1888 in Blackburn, Lancashire. He was christened on 29 May 1888. He died before 1891. M ix Thurston JACKSON-J0309 # was born on 12 Jan 1890. He died on 01 Jul 1965. 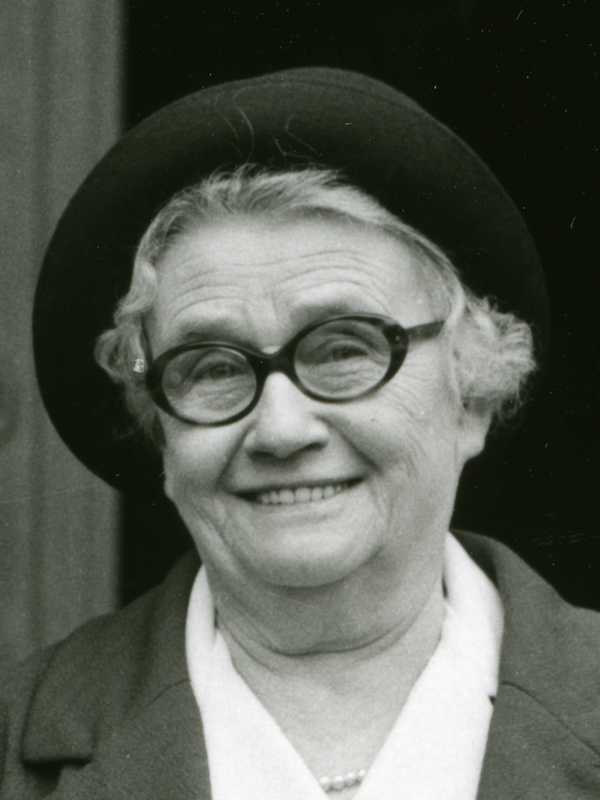 Alice JACKSON-J0302 was born on 03 May 1892 in Blackburn, Lancashire. She was christened on 24 May 1892. She died on 12 Aug 1910 in Blackburn, Lancashire. She was buried in Aug 1910 in Old Cemetery, Blackburn, Lancashire. Alice was recorded in a census 1 on 31 Mar 1901 at 42, Oxford Street, Blackburn, Lancs. James JACKSON-J0318 was born about 1895 in Blackburn, Lancashire. James was recorded in a census 1 on 31 Mar 1901 at 42, Oxford Street, Blackburn, Lancs. He was recorded in a census on 02 Apr 1911 at 42, Oxford Street, Blackburn, Lancs. Thomas JACKSON [Parents] [scrapbook]-J0501 # was born about 1826 in Ribchester, Lancashire. He was christened 1 on 18 Mar 1826 in Ribchester, Lancashire. He died 2 on 28 Mar 1880 in Blackburn, Lancashire from brights disease and dropsy. Thomas married 3 Mary BARTON-B0505 # on 11 May 1845 in St Johns, Preston, Lancashire. Thomas was recorded in a census on 07 Jun 1841 at 10, Sergeant St, Preston, Lancashire. He was recorded in a census 4 on 30 Mar 1851 at 18 Ribbleton Street, Preston, Lancashire. He was recorded in a census 5 on 08 Apr 1861 at 34, Lyon Street, Blackburn, Lancs. He was recorded in a census 6 on 02 Apr 1871 at 6, Byron Street, Blackburn, Lancashire. On his marriage certificate (11 May 1845), Thomas states his age as 21. This would put his birthdate between 12May1823 and 11May1824. It could be that the Vicar just put 21 for both of them (ie as being of full age) or that Thomas lied about his age - he was probably only 19. In the 1851 Census at Ribbleton St, Preston, his age is stated as 23. However, this would put his birthdate between 31Mar1827 and 30Mar1828, which must be wrong since he was baptised 18 Mar 1826. I can't see any reason why he would understate his age at this stage of his life - I need to recheck the original census image. In the 1861 Census at Lyon St, Blackburn, his age is stated as 40. This would put his birthdate between 8Apr1820 and 7Apr1821, some 5 or 6 years older!! One possible explanation of this is that the age of one of his sons (Richard) is shown as 18 (whereas he was probably only 15) and Thomas may have wanted to give an age that was more consistent with having an 18 year old son (saying 35 would have put the birth at his age of 17). By 1871, he is living in Byrom Street, Blackburn and has given his age as 46 (d.o.b. range 3 Apr 1824 to 2 Apr 1825) which is perhaps nearer the mark. The most likely reason for the inconsistency in dates of birth, is that they were probably illiterate, had no written records themselves or had simply lost track. Mary BARTON [Parents] [scrapbook]-B0505 # was born about Sep 1825 in Preston, Lancashire. She was christened 1 on 12 Sep 1825 in the Roman Catholic Church of St Wilfred in Preston, Lancashire. She died 2 on 22 May 1859 in Blackburn, Lancashire from phthisis. Mary married 3 Thomas JACKSON-J0501 # on 11 May 1845 in St Johns, Preston, Lancashire. Mary was recorded in a census on 07 Jun 1841 at Cunliffe Street, Preston. She was recorded in a census 4 on 30 Mar 1851 at 18 Ribbleton Street, Preston, Lancashire. At the time of her marriage, Mary gave her age as 21, which gives a d.o.b. range of 12 May 1823 to 11 May 1824. When Mary died on the 22 May 1859, her husband gave her age as 36 years (however he wasn't very accurate with his own ages). This gives a d.o.b. range of 23 May 1822 to 22 May 1823. It is possible that she was born between 12 and 22 May 1823 but just as likely that one of the ages given is incorrect. Richard JACKSON-J0408 was born about 1845 in Preston, Lancashire. Richard was recorded in a census 1 on 30 Mar 1851 at 18 Ribbleton Street, Preston, Lancashire. He was recorded in a census 2 on 08 Apr 1861 at 34, Lyon Street, Blackburn, Lancs. He was recorded in a census 3 on 02 Apr 1871 at 52, Brunswick Street, Blackburn, Lancashire. Ellen JACKSON-J0409 was born about 1846 in Preston, Lancashire. Ellen was recorded in a census 1 on 30 Mar 1851 at 18 Ribbleton Street, Preston, Lancashire. She was recorded in a census 2 on 08 Apr 1861 at 34, Lyon Street, Blackburn, Lancs. M iii Thomas JACKSON-J0410 was born about 1848. He died before Apr 1891. M iv Joseph JACKSON-J0411 was born in Mar 1851. M v John JACKSON-J0401 # was born on 18 May 1853. He died on 24 Apr 1927. M vi James JACKSON-J0416 was born about 1856. Richard JACKSON [Parents]-J0601 # was born about 1797 in Ribchester, Lancashire. He died after Mar 1851. Richard married Margaret CLAYTON-C0602 # on 11 Aug 1823 in Ribchester, Lancashire. Richard was recorded in a census on 07 Jun 1841 at 10, Sergeant St, Preston, Lancashire. He was recorded in a census 1 on 30 Mar 1851 at 18 Ribbleton Street, Preston, Lancashire. Margaret CLAYTON [Parents]-C0602 # was born about Sep 1803 in Ribchester, Lancashire. She was christened 1 on 02 Oct 1803 in the Church of Saint Wilfred in Ribchester, Lancashire. She died after Mar 1851. Margaret married Richard JACKSON-J0601 # on 11 Aug 1823 in Ribchester, Lancashire. Margaret was recorded in a census on 07 Jun 1841 at 10, Sergeant St, Preston, Lancashire. She was recorded in a census 2 on 30 Mar 1851 at 18 Ribbleton Street, Preston, Lancashire. M i Thomas JACKSON-J0501 # was born about 1826. He died on 28 Mar 1880 from brights disease and dropsy. Thomas JACKSON [Parents]-J0410 was born about 1848 in Preston, Lancashire. He died before Apr 1891. Thomas married Hannah Atkinson PEARSON-P0401 on 30 Mar 1872 in Blackburn, Lancashire. Thomas was recorded in a census 1 on 30 Mar 1851 at 18 Ribbleton Street, Preston, Lancashire. He was recorded in a census 2 on 08 Apr 1861 at 34, Lyon Street, Blackburn, Lancashire. He was recorded in a census 3 on 02 Apr 1871 at 52, Brunswick Street, Blackburn, Lancashire. He was recorded in a census 4 on 03 Apr 1881 at 60, Brunswick St, Blackburn, Lancashire. Hannah Atkinson PEARSON-P0401 was born about 1846 in Kendal, Westmorland. Hannah married Thomas JACKSON-J0410 on 30 Mar 1872 in Blackburn, Lancashire. Hannah was recorded in a census 1 on 03 Apr 1881 at 60, Brunswick St, Blackburn, Lancashire. She was recorded in a census 2 on 05 Apr 1891 at 1, Pump Street, Blackburn, Lancashire. Joseph JACKSON-J0320 was born about 1875 in Blackburn, Lancashire. Joseph was recorded in a census 1 on 03 Apr 1881 at 60, Brunswick St, Blackburn, Lancashire. He was recorded in a census 2 on 05 Apr 1891 at 1, Pump Street, Blackburn, Lancashire. 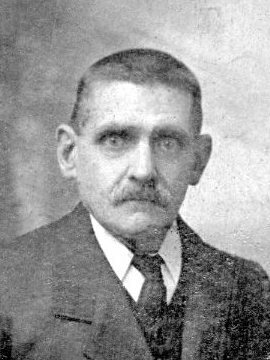 James JACKSON-J0321 was born about 1878 in Blackburn, Lancashire. James was recorded in a census 1 on 03 Apr 1881 at 60, Brunswick St, Blackburn, Lancashire. He was recorded in a census 2 on 05 Apr 1891 at 1, Pump Street, Blackburn, Lancashire. Mary Ann JACKSON-J0329 was born about 1882 in Blackburn, Lancashire. Mary was recorded in a census 1 on 05 Apr 1891 at 1, Pump Street, Blackburn, Lancashire. William ALSTON [Parents]-A0501 # was born on 18 Oct 1812 in Gisburn, Yorkshire. He was christened 1 on 22 Nov 1812 in Saint Mary the Virgin, Gisburn, Yorkshire. He died in From Mar 1867 to Mar 1871. William married 2 Ellen ROSTRON-R0502 # on 08 Jun 1835 in the church of Saint Mary the Virgin, Blackburn, Lancashire. William was recorded in a census on 07 Jun 1841 at Kay Street, Blackburn, Lancashire. He was recorded in a census 3 on 30 Mar 1851 at Jubilee Street, Blackburn, Lancashire. He was recorded in a census 4 on 08 Apr 1861 at 8, Jubilee Street, Blackburn, Lancashire. The identity of William's father is not known. Unlikely to have been Thomas Exton, as Hannah married him almost five years later. Possible death record for William. The age and timing are about right. It is also unusual to describe someone aged 60 as 'the son of' but the only record we have for William's birth/baptism, only shows a mother's name 'Hannah Halstead'. The surname found in records for this family take three forms Alston, Alstead or Halstead and appear to change randomly rather than any deliberate attempt to change - presumably this is down to parish clerks and enumerators writing down what they believe they heard. On the 30 Mar 1851, the surname Alston was used on the census but Halstead used when his son Thomas was baptised on the same day!  Ellen ROSTRON [Parents]-R0502 # was born about 1814 in Oxford, Oxfordshire. She died in Apr 1866 in Moor Street, Blackburn, Lancashire. She was buried 1 on 23 Apr 1866 in the Church of Saint Mary the Virgin, Blackburn, Lancashire. Ellen married 2 William ALSTON-A0501 # on 08 Jun 1835 in the church of Saint Mary the Virgin, Blackburn, Lancashire. Ellen was recorded in a census on 07 Jun 1841 at Kay Street, Blackburn, Lancashire. She was recorded in a census 3 on 30 Mar 1851 at Jubilee Street, Blackburn, Lancashire. She was recorded in a census 4 on 08 Apr 1861 at 8, Jubilee Street, Blackburn, Lancashire. M i Edward ALSTON-A0408 was born about Aug 1836. He died on 12 May 1904. 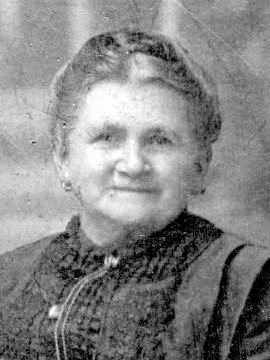 Mary Ann ALSTON-A0430 was born 1 about May 1838 in Blackburn, Lancashire. She was christened 2 on 27 May 1838 in the church of Saint Mary the Virgin, Blackburn, Lancashire. Celia ALSTON-A0407 was born 1 on 03 Feb 1840 in Blackburn, Lancashire. She was christened 2 on 05 Jun 1840 in the Church of Saint Mary the Virgin, Blackburn, Lancashire. She died 3 about Feb 1855 in Blackburn, Lancashire. Celia was recorded in a census on 07 Jun 1841 at Kay Street, Blackburn, Lancashire. She was recorded in a census 4 on 30 Mar 1851 at Jubilee Street, Blackburn, Lancashire. As with other members of this family, the seemingly random usage of surname variants increased the difficulty in finding records. and, as she doesn't appear in any further records (marriages or census) it seems probable that the death record for Celia ALSTON in 1855 is her. M iv John ALSTON-A0406 was born on 19 Nov 1841. He died about Aug 1895. M v William ALSTON-A0405 was born about 1844. M vi Thurston ALSTON-A0404 was born on 02 May 1846. F vii Hannah ALSTON-A0403 was born on 12 May 1848. Thomas ALSTON-A0402 was born 1 on 11 Mar 1851 in Blackburn, Lancashire. He was christened on 30 Mar 1851 in the Church of Saint Mary the Virgin, Blackburn, Lancashire. Thomas was recorded in a census 2 on 30 Mar 1851 at Jubilee Street, Blackburn, Lancashire. He was recorded in a census 3 on 08 Apr 1861 at 8, Jubilee Street, Blackburn, Lancashire. He was recorded in a census on 02 Apr 1871 at 11, Foundry Hill, Blackburn, Lancashire. He was recorded in a census on 03 Apr 1881 at 29, Oxford Street, Blackburn, Lancashire. F ix Mary Ann ALSTON-A0401 # was born on 13 Jan 1854. She died on 13 Dec 1938. Isaiah JACKSON [Parents] [scrapbook]-J0315 # was born 1 on 25 Jan 1888 in Blackburn, Lancashire. He died 2 on 06 Jun 1977 in Blackburn, Lancashire from chronic bronchitis. Isaiah married 3 Florence Emma WARD-W0301 # on 14 Apr 1934 in Register Office, Blackburn, Lancashire. Isaiah was recorded in a census 4 on 05 Apr 1891 at 53, Henrietta Street, Blackburn, Lancashire. He was recorded in a census 5 on 31 Mar 1901 at 53, Henrietta Street, Blackburn, Lancashire. He was recorded in a census on 02 Apr 1911 at 151, Downham Street, Blackburn, Lancashire. Isaiah was born in 1888 in the house of his uncle, John Eddleston, who lived at 53, Henrietta Street in the St Paul's Ward of Blackburn. Isaiah's father, William Henry Jackson, was 18 years old at the time. Isaiah was more commonly known as Ike, although Florence always called him 'Harry' - as that is what he said his name was the first time they met!. At the time of the 1901 Census (aged 13), Ike was working as a Cotton Weaver. Later he worked for the Blackburn Company of 'Clayton & Goodfellows' as a Millwright and Out-Fitter, a profession which caused him to travel frequently around the North of England and the Midlands and, as a reserved profession, also protected him from conscription into the WW1 forces. The electoral registers for Blackburn show that he was living at 6 Fort Street from 1904 until 1912/13, although at the time of his marriage in 1911, Isaiah gave his address as 151, Downham St, Blackburn. No electoral lists were produced during the war, so it is not known where he moved to after that. In July 1911, at the age of 23, Ike married a Blackburn girl Mary Agnes Burke and they had 5 children, the last being twins Frank and Edith, born in February 1918. However, in 1912, whilst working away from home in the Derbyshire area, Ike met Florence Emma Ward, who was living with her grandmother, Mary Bates, at 'The Black's Head' pub in the village of Wirksworth. Florence would have been aged 16 at the time. Florence became pregnant and was sent back to her parents in Sheffield. She gave birth to a son in July 1913 at 33, Lime Street. He was given the name of William Ward and no father's name was recorded on the birth certificate. Ike and Florence had three more children whilst she was living in Sheffield. John Ward in 1915, a child who was stillborn or possibly died as an infant and Olive Jackson in 1919. In 1920, a 'Josiah Jackson' appears in the Sheffield electoral register living at 18, Carrfield Road (next door to Florence's parents) and is described as a Journeyman Millwright. This is the same address at which Olive was born in October 1919 and given the surname of Jackson - this must have been Isaiah and perhaps is an indication that he had left his wife Mary around 1918 or 1919. Ike and his 'new' family must have moved to Blackburn in 1923. Grace was the first to be born there in October 1923, at 50, Ash Street, where Ike and Florence where living as guests of his brother William. In the electoral lists for Blackburn, Isaiah appears to have 'officially' moved into his Brothers house at 50, Ash Street in 1925 (William was there from 1921) but there is no mention of Florence. He is still at that address in 1934 when the name of Florence Jackson also appears. In 1935 Isaiah and Florence briefly moved to 1,Culshaw Street in Blackburn but were at their final home of 15, Cromwell Terrace by 1937. Ike did not divorce his first wife and didn't marry Florence until the 14th April 1934, about 2 weeks after Mary died. In his retirement, Ike enjoyed keeping tropical fish and looking after his rose garden at Cromwell Terrace. He was well known for following the milkman's horse and cart for manure!! Florence was a good cook and the aroma of freshly baked bread often greeted you upon entering the house. Florence Emma WARD [Parents] [scrapbook]-W0301 # was born on 06 Feb 1896 in Middleton, Derbyshire. She died on 25 Dec 1979 in Blackburn, Lancashire. Florence married 1 Isaiah JACKSON-J0315 # on 14 Apr 1934 in Register Office, Blackburn, Lancashire. Florence was recorded in a census 2 on 31 Mar 1901 at Normanton, Derby, Derbyshire. From the 1901 Census and comments in a letter to Florence that I have from her Aunt Mabel (B0425), it appears that Florence was brought up by her Grandparents Richard and Mary Bates. Mabel, in her letter, says that it can't have been nice being brought up in a pub. Richard was the Landlord of The Black's Head pub in Wirksworth when he died in 1911. It is not known if Mary became the licensee after his death but if so, this could be where Isaiah met the young Florence whilst he was working in that area around 1914. M i William WARD-W0204 was born on 24 Jul 1913. He died on 28 Oct 1983 from a Myocardial Infarction (Heart Attack). M ii John WARD-W0202 was born on 08 Apr 1915. He died on 13 Mar 1984. JACKSON-J0210 was born in 1916/1918. She died in as an infant or stillborn. It is said that Florence and Isaiah had another child before Olive was born. However, there are variations in the detail - some say that the child was male and stillborn (which wouldn't have been registered at that time), others say that the child was female and died after a few weeks. If anybody has more information please let me know. F iv Olive JACKSON-J0208 was born on 09 Oct 1919. She died on 20 Mar 1997. F v Grace JACKSON-J0205 # was born on 25 Oct 1923. She died on 15 Jun 1984. F vi Florence JACKSON-J0206 was born on 14 Jul 1926. She died on 24 Oct 2016. 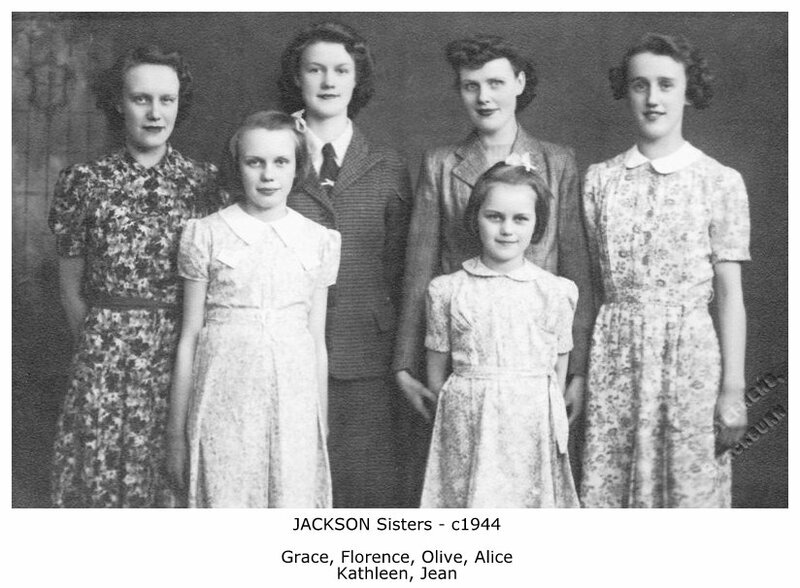 F vii Alice JACKSON-J0209 was born on 24 Mar 1928. She died on 01 Apr 2013. F viii Kathleen JACKSON-J0207 was born on 27 Dec 1930. She died on 08 Jun 2004. F ix Jean JACKSON-J0222 was born on 16 Apr 1934. She died on 01 Jan 1999. Isaiah JACKSON [Parents] [scrapbook]-J0315 # was born 1 on 25 Jan 1888 in Blackburn, Lancashire. He died 2 on 06 Jun 1977 in Blackburn, Lancashire from chronic bronchitis. Isaiah married 3 Mary Agnes BURKE-B0306 on 12 Jul 1911 in St Mark's Church, Witton, Blackburn, Lancashire. Mary Agnes BURKE [Parents] [scrapbook]-B0306 was born 1 about Aug 1890 in Blackburn, Lancashire. She died 2 on 30 Mar 1934 in Blackburn, Lancashire from asphyxia due to inhaling coal gas (suicide). Mary married 3 Isaiah JACKSON-J0315 # on 12 Jul 1911 in St Mark's Church, Witton, Blackburn, Lancashire. Mary was recorded in a census on 02 Apr 1911 at 73, New Park Street, Blackburn, Lancashire. At the end of March 1934, Mary Agnes was accused of stealing £9 from a man she met in a pub. She claimed that he gave her the money but the fear of going to jail led her to commit suicide by gassing herself. See the attached newspaper extracts for more details. Celia Moxham (JACKSON - J0203) thinks Mary Agnes was living in Fort Street Blackburn after Isaiah left her. At the time of her death in 1934, Mary Agnes was living at 124, Wensley St, Blackburn (in the St Pauls Ward). The head of the household was Charles Edward Donelan who was married to Margaret Ellen (a sister of Mary Agnes). Also at the same address were Rachel, Walter and Frank Jackson (J0225, J0226 & J0231) three of Mary Agnes's children. Another couple, John and Mary McNamara also appear in the 1934 Electoral List at this address. F i Rachel JACKSON-J0225 was born on 10 Apr 1912. She died about Aug 1986. M ii Walter JACKSON-J0226 was born on 14 May 1913. He died about Jan 1992. William H JACKSON-J0227 was born 1 about Aug 1914 in Blackburn, Lancashire. He died 2 about May 1915 in Blackburn, Lancashire. M iv Frank JACKSON-J0231 was born on 20 Feb 1918. He died about May 1981. F v Edith JACKSON-J0249 was born on 20 Feb 1918. She died about Feb 1992.